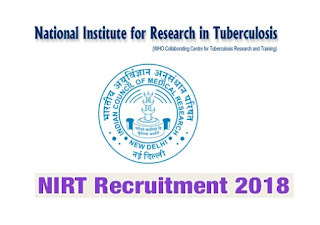 NIRT-National Institute for Research in Tuberculosis Recruitment 2018-2019 Application Form for 03 Scientist B, Project Technical Assistant Posts Download Application through Official website www.nirt.res.in. 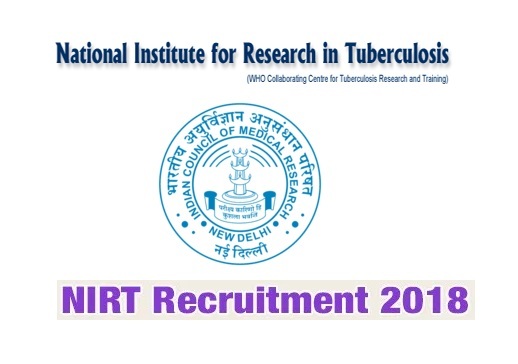 Candidates will have to before Walk in Interview carefully reading the advertisement regarding the process of examinations and interview, eligibility criteria, Offline registration processes, payment of prescribed application fee/intimation charges, More Details below. 2. Project Technical Assistant - Graduate in Computer Science from a recognized University with three years work experience from a recognised Institution OR Master’s degree in Computer Science/IT. (Drawn in favour of Director, NIRT, Chennai by way of demand draft from any Nationalized banks). SC/ST, physically disabled candidates and women candidates are exempted from payment of fees subject to production of valid certificate.